The Rottweiler is a member of the Working Group, which perfectly suits this hard-working breed. These dogs are robust, large, and extremely muscular. They are the descendents of Mastiffs, which were used by ancient Romans do drive herds of cattle and other animals that fed the Roman legions. In addition to being strong, this breed is also incredibly courageous and very loyal. While they are often depicted as scary and aggressive, in reality, Rotties make excellent companions. This dog breed is very loving and will fiercely protect your family. They are also quite intelligent and will work hard to please their owners. However, do be aware that Rotties do require training, so make sure that you have a dog training book on-hand and are ready to attend obedience classes. If they are not properly trained, they tend to assume the role as the alpha, which means that they might think that they rule the roost. Additionally, because these dogs are extremely powerful and heavy, a gentle nudge that they would consider playful could knock a child or even a full-grown adult down to his feet. Therefore, it is extremely important that your Rottweiler is well-trained. A dog crate, dog whistle, a well-fitted dog collar or dog harness, and a tasty and nutritious dog treat are all must-have tools that can be incredibly useful for training. In regards to grooming, this breed does not require extensive care. Their coats are short and they shed little; however, like all breeds, even those with short hair, they do require baths every once in a while with a high quality dog shampoo. While their hair doesn’t mat, they should still be brushed out every once in a while, so make sure that you have a durable dog brush available. Regular puppy pedicures are important, too, so invest in a pair of quality nail clippers for dogs. While all of these products are helpful and even essential for Rottweilers, there’s another product that is even more important, and that’s his dog food. Like all breeds, Rottie have unique nutritional needs, and it’s vital that those needs are being met in order to ensure that their health is properly maintained. Just like a human, if a dog isn’t eating a well-balanced diet of nutritionally rich food, then it’s almost guaranteed that his health will start to fail. Now that you’ve had a look at our top picks for the best Rottie food, let’s take a closer look at each option. Below, we offer an in-depth analysis of each formula, including the ingredients they contain, what we like about them, and what other pet owners have had to say about them. After you read through the reviews and decide on an option that you think will best meet the need of your furry friend, click on the buttons to find the best prices currently available on Chewy and Amazon. Eukanuba dog food is hailed by pet parents and veterinarians, as this brand is made with premium quality ingredients and offers a variety of recipes that are customized to suit the dietary requirements of dogs of all ages, sizes, and breeds. As the name implies, their Breed Specific Adult Rottweiler Dry Dog Food is specially formulated to meet the needs of adult Rottweilers. It contains the essential vitamins and minerals that this breed need to thrive. This recipe is packed with calcium, which is a vital nutrient, as it supports strong and healthy bones, something that is particularly important for Rotties because they are so muscular and robust. It also contains optimal levels of protein, which is sourced from chicken, to build strong joints and muscles, which is also vital for this breed. Natural sources of glucosamine and chondroitin further help to foster strong joints, thereby reducing the risk of hip and elbow dysplasia, conditions that Rotties are prone to. Ground whole grain barley and brewer’s rice are easy to digest carbohydrates that will fuel your pup’s energy levels. This food is also made with guaranteed levels of vitamin E and beta-carotene, which helps to foster a healthy immune system. Lastly, this recipe is made with Eukanuaba’s 3D Dentadefense System, which is clinically proven to minimize tartar buildup within 28 days of eating, thereby improving dental health. Based on the reviews we read, most pet parents are very pleased with this food. 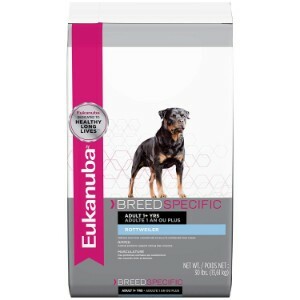 Final Verdict: Eukanuba Breed Specific Rottweiler Adult Dry Dog Food is specially formulated for adult Rottweilers. It contains the essential nutrients that this breed needs to maintain optimal health. 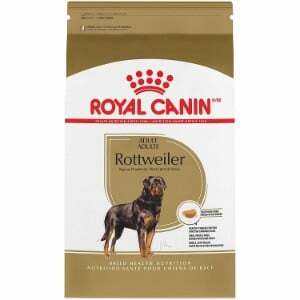 Next up on our list of the best dog food for Rottweilers is Royal Canin Breed Health Nutrition Rottweiler Adult Dry Dog Food. As the name indicates, this Royal Canin dog food is specially formulated to ensure that Rotties are getting the vitamins, minerals, and other essential nutrients that they need to thrive. Plus, the shape, size, and texture of the kibble in this dry dog food is specifically designed for the shape and size of the Rottweilers mouth; therefore, it will help to reduce his food intake, which is important for this breed, as they have a tendency to be zealous eaters, which can lead to obesity and a number of health issues. The kibble also encourages chewing, thereby reducing tartar and plaque buildup and promoting stronger teeth and fresher breath. Rottweilers are genetically predisposed to cardiac sensitivities, and this recipe from Royal Canin helps to prevent these issues, as it is made with key nutrients that help to foster healthier functioning of the heart. It’s also made with brown rice and brewer’s rice, easily digestible carbs that will fuel your furry friend’s high energy levels. According to the reviews that we read, most pet parents who have used this recipe are very happy with the results and state that they’ve noticed a marked improvement in their Rotties’ overall health and demeanor. Final Verdict: To ensure that your adult Rottie is getting the nutrition that he requires, fill his dog bowl with Royal Canin Breed Health Nutrition Rottweiler Adult Dry Dog Food. This formula offers complete balanced nutrition to satisfy the dietary requirements of this breed. Next up on our list of the best dog food for Rottweilers is a Nutro dog food formula. 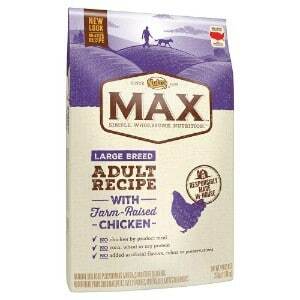 If you’re pup requires a grain free dog food or a dog food for allergies, than Nutro Max Natural Adult Dry Dog Food is an excellent option for him. That’s because this is an all natural recipe that is completely free of corn, wheat, soy protein, artificial colors, artificial flavors, and artificial preservatives. All of the aforementioned ingredients are known allergens for dogs, which means that this recipe shouldn’t cause any adverse reactions. It’s also made in the USA with the finest ingredients, so you can be sure that it meets stringent quality assurance guidelines. This Nutro Max recipe is made with farm-raised chicken and natural sources of glucosamine and chondoritin sulfate, all ingredients that help to strengthen the muscles and bones, thereby reducing the chances of joint health problems. Rotties are prone to issues like hip and elbow dysplasia, so these ingredient are extremely important for this breed. Instead of using harsh grains for carbohydrates, brewer’s rice and whole grain oatmeal are used. These carbs are easy to digest, will keep your pup feeling fuller longer, and will fuel your furry friend’s energy levels. It’s also fortified with essential vitamins, minerals, and other key nutrients that Rottweilers need, such as amino acids, vitamin D3, B vitamins, biotin, vitamin E, calcium, and Vitamin A. In other words, it’s full of all of the good stuff your pet needs and none of the harsh additives that he doesn’t. According to most of the reviews that we read, pet parents are very pleased with this food – and so are their dogs. Final Verdict: if your dog suffers from allergies or has a gluten sensitivity, Nutro Max Natural Adult Dry Dog Food is a fantastic option. It’s completely free of known allergens, such as grains and artificial color, flavors, and preservatives, so it shouldn’t cause any adverse reactions. If you are the proud parent of a puppy Rottie, it’s important to feed your furry friend a kibble that will meet the unique nutritional needs of young dogs; Royal Canin Breed Health Nutrition Rottweiler Puppy Dry Dog Food will do just that. This formula is made for puppies that are over the age of 18 weeks and have been vet-approved to transition from mother’s milk or a puppy milk replacer, up to 15 months of age. The kibble in this formula is specially designed for a puppy’s mouth; it’s smaller, easier to pick up, and encourages chewing, so your pup will get more enjoyment out of meal times. The kibble also encourages chewing, which means that this food will keep your puppy’s developing teeth strong and healthy. Royal Canin also specially formulated this recipe specially for Rottweiler puppies; it contains essential nutrients that support digestive health, support the immune system, and strengthen the bones and joints. In other words, feeding your pooch this kibble will not only keep him happy, but it will keep him health. Pet parents are very pleased with this puppy chow, and so is our team of veterinarians and animal nutritionists. 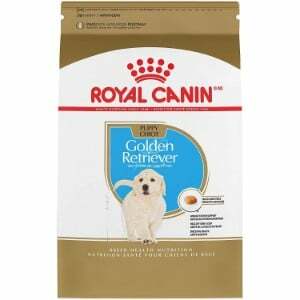 Final Verdict: Royal Canin Breed Health Nutrition Rottweiler Puppy Dry Food is specially formulated to strengthen the vital systems of developing puppies. The uniquely designed kibble also encourages chewing to make meal time easier and more enjoyable. 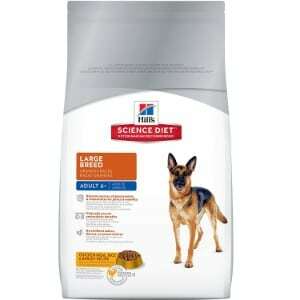 To round out our list of the best dog food for Rottweiler is Hill’s Science Diet Adult large Breed Dog Food. Hill’s Science Diet dog food is made by a team of veterinarians, animal nutritionists, and scientists to ensure that each formula contains the essential nutrients that breeds of all ages, sizes, and breeds need to thrive. This recipe is specially formulated to meet the needs of large breed dogs, which the Rottie is, so you can be sure that it will nourish and strengthen your furry pal. In this recipe, natural sources of glucosamine and chondroitin are used, both of which help to promote stronger bones and joints, thereby reducing the chances of joint issues like hip and elbow dysplasia; conditions that the Rottweiler is prone to. A clinically proven blend of antioxidants also helps to support a healthy immune system. It also contains a bevy of fruit and veggies, such as apples, broccoli, carrots, cranberries, and green peas. These ingredients make the taste more palatable and further enhance the nutritional content. It’s also free of artificial colors, flavors, and preservatives, which reduces the chance of allergic reactions. According to most pet parents, this formula is an ideal option for Rotties. Final Verdict: Hill’s Science Diet Adult Large Breed Dog Food will nourish your adult Rottweiler, keeping him healthy and happy. This recipe is specially formulated for large breeds and support joint health and strengthens the immune system to ensure your pooch lives his best life. If you’re the parent of a Rottweiler, you know how devoted and loving your canine companion is. Despite the negative stigma that the Rottie is often associated with, this breed is super loyal, playful, and wonderful with people of all ages. Like any other member of your family, you want to ensure that you are providing your pooch with the very best of care; and the best care starts with the highest quality nutrition. To ensure you are selecting an excellent, nutritionally balanced food for your furry friend, we’ve put together this handy buyer’s guide for you. Below, find out why nutrition is so important for a Rottweiler and what the nutritional needs of this lovable breed are. Just like balanced nutrition is important for humans, it’s also important for canines. By eating a well-balanced, nutritionally rich diet, you can ensure that your Rottweiler is getting all of the vitamins, minerals, and other nutrients that he needs in order to support his overall health and well being. Rottweilers are prone to certain health conditions, and the type of food that they eat can help to stave off these conditions by strengthening their vital systems. There’s no doubt that you want your canine companion to life the healthiest and happiest life possible; and feeding him nutrient rich food can help to ensure that he does, indeed, maintain a healthy, happy life. High quality proteins. Like all large breed dogs, Rotties are prone to joint problems, which is why protein is so important. In fact, animal nutritionists suggests that protein should make up a large percentage of the food that a Rottweiler eats; up to 35 percent protein is ideal for this breed. However, make sure that the protein is high quality; excellent sources include fish, venison, bison, chicken, and beef. Healthy fats. It’s also important for Rotties to eat food that contains healthy fats, like omega 3 and omega 6 fatty acids. These nutrients help to maintain cell reproduction, which is crucial for so many aspects of your pup’s heath; for example, healthy fats nourish the skin and the coat. Fats also help to fuel energy levels. However, the fat content of your dog’s food should be less than 20 percent; higher levels can lead to health complications. Complex carbohydrates. Carbs fuel energy levels, and since Rottweilers are such an active breed, it’s important to make sure that they are getting the carbs they need to give them the energy they need. Do be aware, however, that complex carbs are much better than simple carbs, as they take longer to break down and will keep your pup feeling fuller for longer and prevent overeating, which can lead to weight gain. Wholesome grains, like barley, brown rice, and oatmeal, are ideal. This breed also requires key macronutrients. Vitamin A and B vitamins are particularly crucial, as they can help to minimize the development of a variety of health problems. Rotties also require calcium and phosphorous, which play a key role in the development of strong and healthy bones. Glucosamine and chondroitin are also important, as they strengthen the muscles and joints, which can reduce the chance of joint health problems; issues that Rottweilers are particularly prone to. Wholesome grains, such as barley, brewers rice, brown rice, and oatmeal. Try to steer clear of corn, wheat, and soy; especially if your pooch has issues with gluten. In addition to these nutrients, you should also steer clear of foods that contain artificial flavors, colors, and preservatives, as well as sugars and fillers. These ingredients can lead to a number of health issues. To ensure that your Rottweiler is as healthy as possible, selecting a high quality, nutritionally balanced food is crucial. All of the recipes featured in this review have been approved by animal nutritionists and veterinarians, as they meet the nutritional needs of this large, gentle, and loving breed.